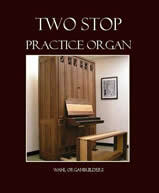 Wahl Organbuilders completed a second series of two-stop practice organs. New features expand on the capabilities of the previous series while refining the design for mechanical simplicity and ease of relocation. This small organ is ideal for practicing any standard repertoire. With its compact design—the basic footprint is similar to that of an upright piano—the instrument fits easily in a home, apartment, or small studio under an eight-foot ceiling. The key action, winding, and voicing are sensitive, promoting good technique and performance. The scaling and voicing of the pipework offers responsive yet refined sound to allow for hours of playing without aural fatigue. The modular design of this instrument allows for quick installation, typically taking only a few hours. Service access to the back of the instrument is easy with built-in wheels in the base to roll the instrument. The unique design of the organ keeps the action in proper adjustment during any move, be it across the room or across the country. Wahl Organbuilders has constructed a third series of practice organs which include independent full length bass octaves for both ranks and additional couplers. Wahl Organbuilders has published a book documenting the design and construction of these instruments. You can preview the first fifteen pages or purchase the book . Click on the cover to go to the publisher's site.